Who uses a Project Portfolio Dashboard? Program managers, group project managers, IT directors, Project owners & CXOs are the target audience for a project portfolio dashboard. These are the people that oversee multiple projects and want to know what is going on with each of them a high level. Project portfolio consists of at least 5 projects. The dashboard is updated once a month or so. What should Project Portfolio Dashboard communicate? When it comes to a portfolio of projects, the users will not be interested in minute details of each project. Rather, they want to know what is going on, where the attention should be focused, how the plan vs. actual performance is, how money is spent etc. In other words, high level details followed up option to drill down. How should our Dashboard look like? Based on above details, we can design a rough sketch of our portfolio dashboard. This sketch will guide us when we implement the dashboard in Excel. The numbers correspond to section 1, 2 & 3 in “What should they communicate” above. How should our dashboard behave? Because this dashboard contains a lot of data and is used by top management, it makes sense to define its behavior too. Reason: lots of data, so users need to be alerted if data entry is incomplete. Also, one set of users enter the data, while someone else views the report. Reason: top managers & project sponsors like to ask questions. So, we should allow for interactive drill down, but still present vital stats up front. Reason: Project sponsors & steering committees have lots of members, often from different parts of a company. And they like to view static version (print out, pdf) when discussing. That is all for this installment. In the next part, Learn how to create a project portfolio dashboard using Excel. 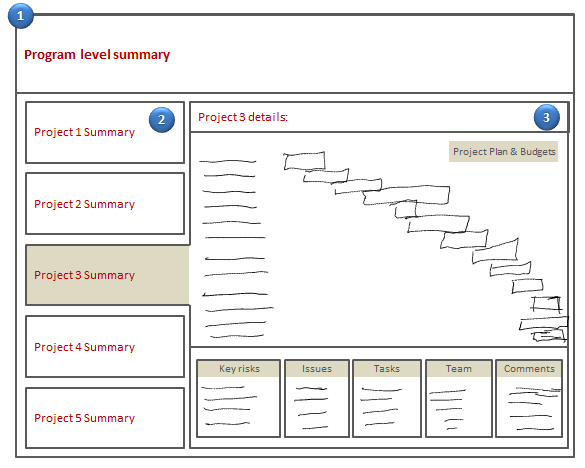 Do you use Project Portfolio Dashboards? When I was working as a business analyst, I used to design such dashboards for some of our clients. Later on, as an Excel consultant too, I have developed few different versions of portfolio & program dashboards. The hardest thing with designing these dashboards is that they have just too much of data. A very high level summary will not do because executives & project sponsors always ask follow up questions like, “So why is this project spending more than $x?”, “What is our mitigation strategy for this risk?”, “Who is handling this issue?” etc. But with a bit of balancing act, we can design a good portfolio dashboard that is not too bloated and not too simplistic. What about you? Do you use or develop such dashboards? What is your experience like? What would you like such a dashboard to communicate? Please share your ideas and suggestions using comments. Chandoo, your sketch looks promising & the key principles to consider when designing it are extremely valid. However, the biggest pain I have experienced when designing similar project portfolio overviews is how to make it scaleable. I.e how to fit in neatly "a summary of all projects" in case there might be 5 or 20 or even 50 projects. This is a problem I faced too. I think the best option is to show lagging / struggling projects upfront and give user a choice to scroll down to see more projects. Another way would be to give a sorting control to user so that they can see "Good news first" or "Bad news first". Looks great! Cant wait to see part 2. Timely topic for me. Looks very promising. Would like to see costs broken out by type (i.e. Internal, External and Capital). Would like to see how we are doing on contractor spend as well as other expenditures. Thanks. It is a good idea to see where money is going. Often such details are captured by accounting systems in companies (ABC etc.) Once Project wise costing details are available, we can easily add additional charts, information to this dashboard. PS: I will only be using highlevel & task level budget performance in this dashboard, but you can extend to do more. This is a fantastic topic,and addresses the very reason I stumbled upon your website in the first place. The questions you're asking are very valid - how much detail should be included, and how much is too much? What is really important? The second part of that question, which is just as important as the first part, is how to display the information in a tangible, useful way. If your audience is Project Managers AND the company president, how do you summarize what is happening with 50+ projects in a way that is meaningful to both? I'll leave it to your genius to figure that one out! In the meantime, I'll keep tinkering. Thanks Chandoo...I am looking forward to seeing Part 2 of this. 1. Can we add key projects achievements/accomplishments box since the last update. 2. A link where it shows history of key achievements/accomplishments since the project started. Look forward for second part. -There is a high number of developed performed over the time. Some of them gets closed hopefully. The project team can learn a lot from these. The board usually is interested in the projects closed in the last period and the open projects. A sorting option would be useful what status to show on the dashboard. - It is also interesting how much revenue these projects will generate. Maybe a selling funnel could be implemented to show how much is in RFQ, then in quote phase, how much is in design phase, how much in process design or validation and how much is just before launch. - There are industries where the projects have given phases/milestones and showing the GYR status of the milestones for each project on one page is also useful to see how healthy the project management is. Hey Chandoo, Exactly what I am looking for! Have used your previous ones, and waiting for improvements! Looking forward to it! Great and very useful topic, Chandoo. I second Mirko's comment - a scalable solution that can handle up to 50 projects would be immensely useful, especially if the 'tabs' at left can include conditional formatting to highlight ones that are overdue, over budget, pending review or completed. Looking forward, like everyone else, to Part 2.
i cant wait for the final outcome of the dashboard.... since u do an interactive dashboard, i'm interested to see how u balance the info in the print out version and the interactive version. I am looking forward to part 2! I would like to see resource capacity on the main dashboard. We have a formula we use for our teams, based on all the projects. Can't wait to see the rest of this topic, any idea when part 2 will be published? Very relevant correlation to new business development at my workplace! Great idea!! I agree with comments about scaling and would like to add one more. The need to have multiple team members contribute to the detail that sums up to make the dashboard. How can we collaborate in the 'cloud'? Any idea when we will see part 2? Its been awhile, looking forward to it! This is going to be a great topic to follow. I am eager to see how this might be applied to a single project involving several hundred work orders, each with their own schedule (each schedule with a few key sequential milestones to be tracked). very good dashboard! We would be interested in purchasing your Project Portfolio Dashboard and using it in our organisation. However, there are some questions about it. 1. Is it easily customizable? Can an average Excel user without programming skills change/add own sheets and features? 2. The list of projects looks good. But how can we see an overall time-line where all the projects are present (a kind of Ghantt Chart where there are projects/programs instead of single activities)? Is it possible to add such a visualisation? 3. How can we collect the projects into programs? Is it possible?